The cookie tin is bare, the gifts are opened...Christmas is on the wane. Did you get a Poinsettia,Amaryllis, or other gift plant from someone special? Proper care tips will keep your Christmas gift plants, and Christmas memories, alive and well. Seasonal decor will soon be packed away. I hope you received a gift plant for the holidays, to fill the void. "Christmas" cactus and Poinsettias are both popular choices. They are now offered in a wide array of varying hues and forms. Blooming gardenia, jasmine, camellias, and citrus are popular winter gift plants. Amaryllis are exchanged across the land, as are other forced bulbs such as paperwhite narcissus and tulips. The plant choices are diverse, but the following care tips should keep all potted plants thriving through the winter. Watering, lighting, and temperature are most important to winter care of potted plants. Humidity, fertilization and pot size are minor concerns. Water - Correct watering may be the single most important factor in the survival of typical potted plants. Filtered water, "spring" water, or rain water are best for most plants. Correct watering for almost any plant means keeping the soil moist. Moist is notsoggy, and moist does not mean "water the plant every day." Plants in the great indoors, in winter, don't grow much. Therefore, they need very little water. Touch the soil surface and do not add water if you feel any dampness. "Heft" the pot to gauge its weight (wet soil weighs more than dry) to help you decide when to water. And never, ever let a plant sit in excess water. Light - Dim lighting won't immediately harm plants. Place plants as you wish for the height of the holiday season. But for long term plant health, good lighting is very important and rarely exists in the average home. Of these holiday gift plants, gardenia, camellias, and amaryllis need the brightest light. Plants that need more light will have progressively smaller leaves, on longer skinnier stems. Plants can use good light (bright enough for you to read by easily) for up to twelve or fourteen hours a day. Fluorescent light works well, supplying brightness without heat. Direct window light can vary greatly, from gentle morning light to those days when sunshine streams full blast, magnified by snow reflection, into a south facing window. Use your judgement in placing plants near windows, use sheer curtains to soften strong window light, and watch for signs of sunburn or overheating of plants at south facing windows. Temperature - Daytime temperatures between 60 to 70 degrees keep most potted plants content. In these money and energy-saving days, many of us are keeping our thermostats in that range. Do not set holidays plants in the direct path of forced hot air. Realize that windows can radiate cold at night. When plants sit near a window, keep the leaves away from the frosty glass. "Christmas cacti," amaryllis, citrus, gardenias, and camellias all respond to good care to become long lived specimens. Poinsettias and forced bulbs other than Amaryllis, are often not worth an extra effort beyond keeping them looking fresh for a few extra weeks. Humidity - Take it easy; humidity is rarely the "root" cause of problems for potted plants. But gardenias are sensitive to dry air, and can lose unopened buds. A room humidifier will make both plants and people more comfortable during the winter. Keeping plants grouped together helps them humidify each other. Misting and pebble trays boost humidity only slightly; misting can lead to leaf fungus. Plants kept in a bright, active kitchen or bathroom may enjoy the extra humidity of hot water use. Fertilizer - Amaryllis is just beginning a season of growth after the flowers fade. Fertilize amaryllis with houseplant fertilizer as long as it is in the house. For all other gift plants, and in general for indoor plants, do not fertlize until spring. Use the first official day of spring, the vernal equinox, as an approximate start date to feed potted plants for the growing season. Even indoor plants seem miraculously in tune with the season, and will show new or more energetic growth as spring approaches. New growth needs new nutrients. Soil and pot - Gift plants come planted in a reasonably promising potting mix. After all, the plants do need to survive the rigors of transport and maybe some time spent on a store shelf. Do not repot a plant at this time. Consider repotting in spring, when the plant has begun to show enthusiasm for new growth. If the plant arrived in a decorative butnon-draining pot or covering, take care that the plant does not "steep" (rot) in excess water. Christmas cacti are fairly easy to grow and rebloom. Keep them potted. They'll enjoy summer outside in a shaded location. Forced tulips and narcissus will wither and die in a month or two. You may discard them, or plant them later knowing that further blooms are rare or delayed with forced bulbs. Amaryllis will bloom each year with good summer care. They can be kept in pots, or planted in the flowerbed for the summer. Gardenias, camellias, jasmine, and citrus can be kept as potted plants or considered as landscape additions in the warmer zones. They'll withstand only light, infrequent frost.Gardenias can be particularly fussy plants. Poinsettias will not rebloom unless you follow a detailed schedule of light and dark, which most home gardeners find too difficult. 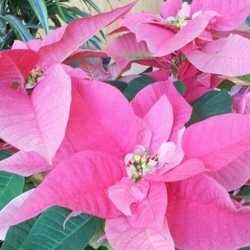 Poinsettias can become permanent landscape plants in tropical gardens.